Established in the year 1989, Chawla & Choudhary Trading Co Pvt Ltd started as a trading company for winding and it's allied equipment. Our company ventured into manufacturing, exporting and service providing of Coil Winding Machines. Our unparalleled array of products include Transformer Winding Machines, HT Coil Winding Machine, LT Coil Winding Machines, Toroidal Winding Machine, Winding Accessories and Automatic Winding Machines. All the machines are manufactured using premium grade metals and electrical components to assure their high performance. Known for their robust construction, unmatched reliability, high durability and proven performance; our machines have application in power, automobile, electrical and electronics, healthcare, aerospace, defense and many more. Furthermore, our fair business policies have always attracted our clients to deal with us and get profitable returns from the business relationship. We always do a detailed evaluation of client's application and production need prior to providing the winding solution. Because of this, the offered winding solution has a longer functional life and provides the highest productivity. In addition, we offer products at the best price possible. Our products are highly appreciated by our clients for their unmatched quality and unbeatable prices. Mr. Achal Chawla, our Managing Director plays the vital role in our success & continuous growth. His knowledge and rich experience in this domain help us in meeting all the industrial requirements with perfection. Quality is the main motive of our organization and we put of quality extra effort to attain the quality as defined by the industry. Therefore we pick quality centric retailers for sourcing our raw components. The complete range of items is made as per the set market norms and values under the strict supervision of our professionals. 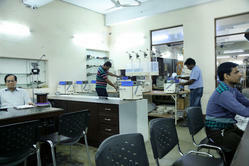 All the developed products are tested at different levels so as to ensure its defect free nature and quality. We have a very creative and highly energetic team, with maximum years of experience in the winding industry. Our facility equipped with latest design facilities to derive most effective winding solutions. Our ability to work closely with all our customers has helped us continuously improvise our products and deliver efficient winding solutions. Our Quality centric approach and belief in complete customer satisfaction has helped us attain a highly regarded position in our business.